Our experience of recruiting digital staff at Stockport Council has clearly shown that the Digital Skills gap both in the workplace and wider community is growing. Talking to peers confirms that we are not alone in facing this problem. With an increasingly digital culture and growing consumer demand to be able to access services 24 hours a day from anywhere, the gap is widening. Businesses are struggling to rectify these shortages due to lack of time for training, lack of cash to pay for the training and most of all the inability to identify the appropriate ways and means to fill the gaps. Here at Stockport Council we are working on digital transformation across our organisation. Our vision is to greatly improve the customer experience offered to residents and service users by embracing all the advantages digital solutions bring. Our focus is on online self-service, improved customer contact, providing information, engaging with local communities and creating a joined up view of our customers to provide the right services at the right time. And to do this we need what? You guessed it, a fully enabled, capable, empowered and sustainable digital workforce working together to do the right things, right. So let’s start with what we’ve done. We assessed the systems, development languages and processes we were currently using and those we would use going forward. We uncovered knowledge gaps and new job roles that we needed to fill. 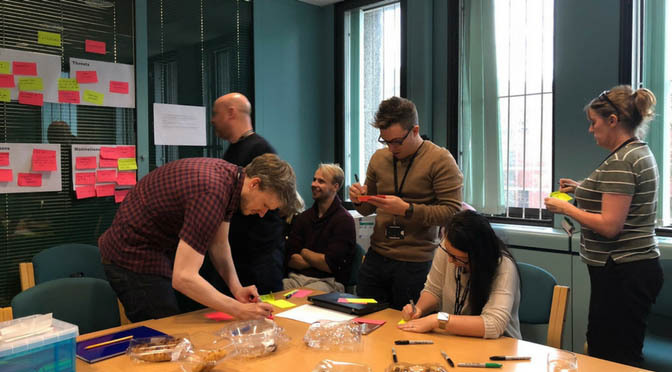 We built a team of current council staff to work on the project and bring the vision to fruition, who we could help to develop new skills and uncover new talents and we supported our staff to adopt agile development. We built the Stockport Digital Academy. We worked with our staff to complete self-assessments of the skills they have versus what they will need to have in the future and used this information to create a tailored digital skills plan for each person. To support new and current staff to develop within their roles and to become capable, skilled and empowered, we needed to create a blended and integrated, digital learning and development plan. Using a model of professional development which focused primarily on work based learning, supported with bespoke in-house training and minimal external provision we gave people the support needed in a format that would be right for them, at the right time. On the job experience was invaluable to understand how an Agile team operates, learn the various ceremonies and day to day requirements, practice the skills required and contributing to the culture. We introduced pairing with peers and experts to learn best practice and implemented a feedback culture along with networking with like-minded professionals at meet ups. We started communities of practice and informal sessions such as lunch and learn to share interesting information and the odd hobby. Self-learning and formal courses also formed a part of each person’s development plan and we asked people to share anything that might help their teams. 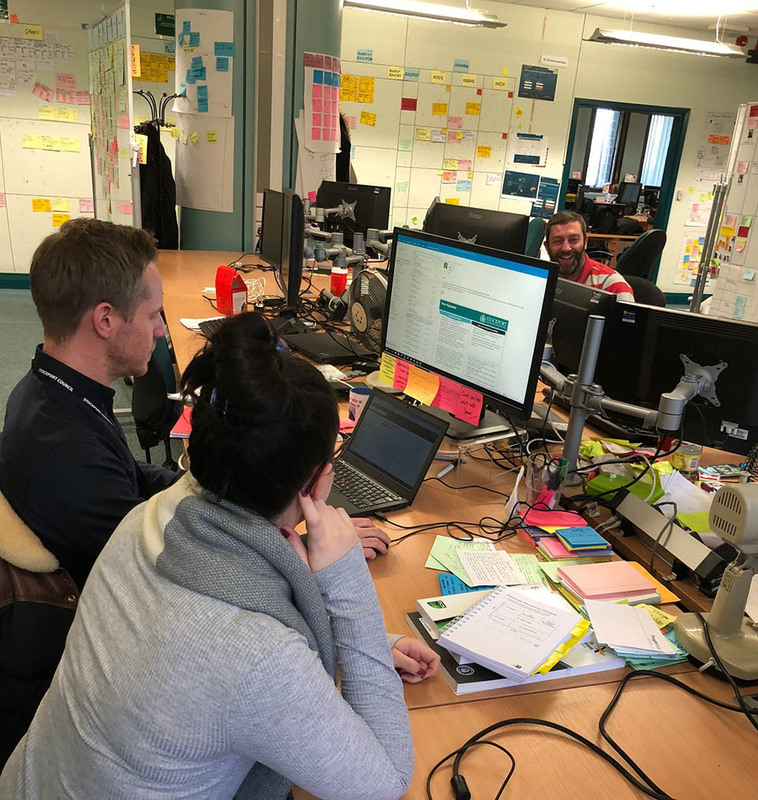 To complete our teams and develop our staff we turned to Digital apprenticeships. In September we took on 4 apprentice developers in partnership with MMU and in 4 years they will graduate with a complete degree and 4 years of work experience. Honouring our commitment to upskilling those in the Borough we have given preference to applicants from within Stockport. With new tech comes new opportunities and the chance to position Stockport as a leader in the areas of public sector transformation, digital skills development and economic growth and as the digital skills gap grows we aim to only get better. I found your article very helpful, it is a key issue for our workforce. We have many young people for whom this is not such an issue as it is for people like me who are the ‘older’ generation. Given the barriers faced by some of groups of young people with disabilities, are you proactively looking to recruit/consider apprenticeships for those with particular skills such as some with autism? Thanks for the comment – it’s a very valid point and something we are actively trying to do. The Council’s recruitment practices are routinely scrutinized by the Corporate Equalities Steering Committee, which works with teams in HR to ensure that people with autism are not disadvantaged by our policies or procedures and that we provide appropriate support to any applicants that need it.